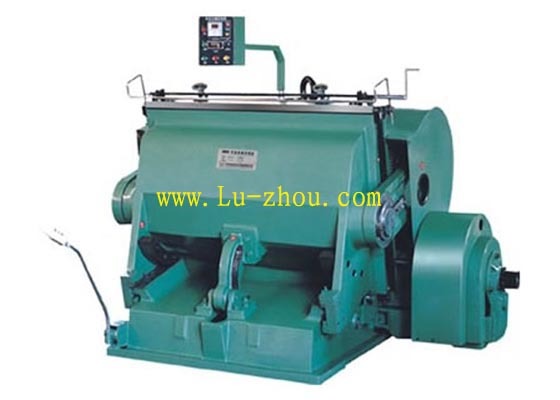 MLCB930 Creasing and Cutting Machine,Die Cutting Machine,Cutting Shaper. MLCB930 Creasing and cutting machine is a special equipment for creasing and cutting all kinds of ordinary paperboard,corrugated paperboard,plastic and leater products, suitable for printing, packing decoration and plastic industries. High strength due to one piece casting by using top quality materials for machine body. Smooth running,big pressure and low noise areobviously remarked as 4-step helical gear mechanism is adopted. Singie plate electromagnetic clutch is sensitive subreliable. Operational altitude is reasonably arranged,Moving-bed opens to its optimun. Electical system is designed in comformity with IEC standard. Single,continuous operation and opening Dwell range is adjustable. Safty system is reatly reliable. Concentrater lubricating system. There are many other sizes die cutting machines.